Search for a Catering Location near you for pricing. Plan now for your next event and count on flavor to be the life of the party. Explore our catering menu, and place your order online or by phone. To make planning any event as seamless as possible, you can either pick up your catering order in restaurant, or let us deliver and set it up for you when you need it. QDOBA Catering offers a customizable spread ideal for any event or appetite. Choose from our hot bar option and let your guests build their own burrito bowls and nachos, piled high with a variety of tasty toppings. Or select our convenient box lunches for a meal packed with flavor - and dessert! Relax and enjoy the party as our catering team helps you create a delicious and memorable occasion. Order QDOBA Catering for your next event. Our delicious hot bar is a great catering option for groups of 10 people or more. Let your guests create their own Mexican-inspired feast – nachos and burrito bowls – piled high with all of the toppings they crave. Each hot bar order comes complete with everything you need to serve a memorable meal. QDOBA boxed meals combine flavor and convenience. A handcrafted burrito loaded with craveable toppings, a side of handmade tortilla chips and salsa, plus a sweet treat are all packed in a box to make hosting easy. One QDOBA handcrafted burrito (Vegetarian, Adobo-marinated grilled chicken, or steak) loaded with slow-simmered black beans, cilantro-lime rice, cheese, and salsa. Side of handmade tortilla chips with your choice of salsa. Choice of a chocolate chip cookie or double chocolate brownie. Complete your catering order by piling on the flavor with fajita vegetables, drinks, dessert, or our signature 3-Cheese queso. Please let us know if anyone in your party has food allergies. Check our Nutrition and Allergen Chart and Ingredients guides. What better way to start the day than having breakfast catered to you? Choose from our selection of breakfast burritos loaded with your choice of protein, and add in more flavors with our fresh salsas while sipping on breakfast drinks. Pre-made breakfast burritos with scrambled eggs, seasoned breakfast potatoes, shredded cheese, pico de gallo, and your choice of grilled chicken or chorizo. At QDOBA, our mission is to deliver flavors that make every occasion a celebration. Our catering menu is designed to please any dietary preferences, from meat lovers to vegetarians and everything in between. Each order comes complete with chafing stands, steam pans and fuel that keep food hot and flavorful, as well as a full set of serving utensils, napkins, bowls and forks. To make clean up a breeze, everything we bring for your order is disposable. However, if you return all the chafing racks to your nearest QDOBA, you will receive a free entrée card. Planning a special occasion? Contact cateringquote@qdoba.com. Catering your event has never been so rewarding. 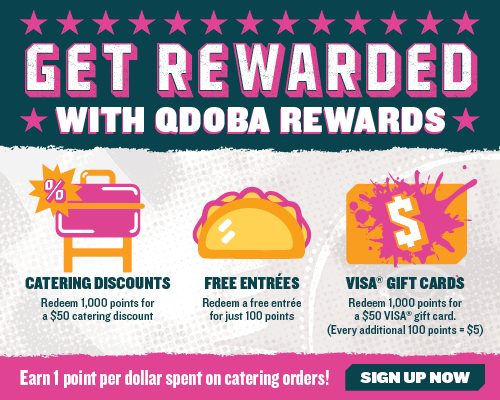 With QDOBA Rewards, earn 1 point for every dollar spent on catering that you can redeem for great perks. Every 100 catering points can get you a free entrée; and every 1,000 catering points can get you a $50 catering discount or a $50 Visa® gift card. For more information, read our Catering Rewards FAQs. Sign up today and start earning. Capture the moment and share your catering photos with us at #QdobaCaters and @qdoba. We love hearing from our fans! Share your latest QDOBA Catering experience with us on Yelp and Google.